When client, Amber Mallon, sought a uniquely personal gift to celebrate the marriage of two friends, she came to BlackOut Design to help bring her idea to life. The concept involved a curated collection of personal and professionally-developed recipes accompanied by a short narrative of its significance to Mallon’s relationships with loved ones and friends. 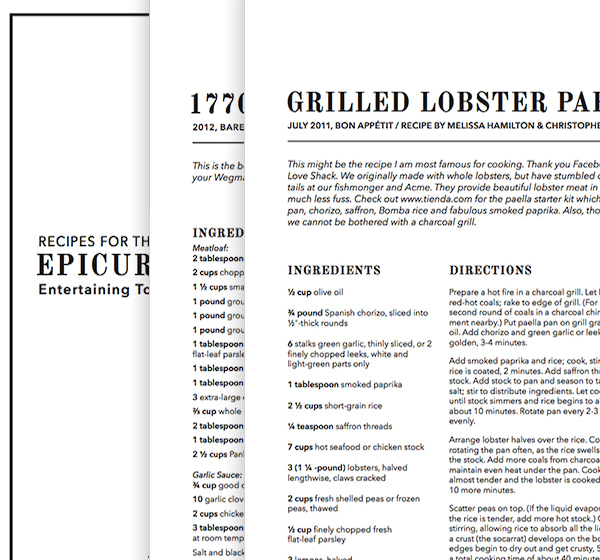 “Recipes for The Epicurean Couple: Entertaining Together, One Bite at a Time,” focuses on the experiences created as a couple while entertaining friends and family at home. The cookbook’s timeless and crisp design brings attention to the recipes and stories contained within. Mallon’s goal was to create a finished piece that felt personal to the individual or couple receiving the gift, while being versatile enough to be an appropriate gift for a variety of occasions, from anniversaries to holiday gifts. The finished piece is an impressive gift that offers utility and personal meaning to each recipient. We are proud to have had a hand in executing such a personal project that is sure to be cherished for years to come.